I know I am late to the party here, as the "Science is a girl thing" video (embedded below) came out Friday and has already been ripped to shreds by many a blog. But I just couldn't stop thinking about it, so here's my opinion on that video and pinkifying science in general. I am reminded of a quote from Pres. Obama's initial campaign. He said (something like) "We need to shatter the blasphemy that says a black child with a book is acting white." It is equally true that "we need to shatter the blasphemy that says a woman in science is acting masculine." Sometimes women in science dress down and wear less make up on purpose because they are worried that they won't be taken seriously if they look 'girlie' or even 'attractive'. Or specifically, "If I look like I took a long time doing my hair, nails, and make up, people might think I am not spending time doing science." It is just as sexist to think that a woman wearing heels in the lab is less capable or less dedicated to science as it is to think that women shouldn't be in a lab in the first place. What a woman wears to the lab (within lab safety guidelines anyway) has NOTHING to do with how good she is at science or with how seriously she takes her work. NOTHING. The woman who wears heels and makeup, the woman who wears the same sweatpants 3 days in a row, and the woman who wears a t-shirt with jeans should all be taken equally seriously as scientists and judged on their work and not their appearance. Being 'masculine' does not help you be a better scientist and for crissake women, do not brag about having a 'masculine brain'. You are not helping inspire young girls to success when you attribute your intelligence and ability to being like a man. I fully support feminine scientists and pink science equipment. 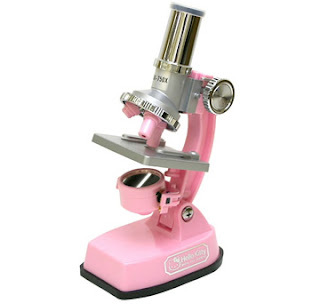 There is no reason that a microscope shouldn't be pink and there is no reason that a girl shouldn't be able to have her own Computer Engineer Barbie if she wants one. The message that you can both care about shoes and be a successful working scientist is important. 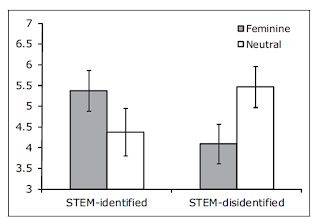 It helps shatter the stereotype that scientific women are or should be masculine. Recently a study by Betz and Sekaquaptewa (2012) investigated the influence of overtly feminine cues (such as pink clothes, makeup, etc) on middle-school girls' interest in math as a future career. They had the students read an magazine-style interview with a feminine woman (pictured as wearing make up and pink and described as liking fashion magazines), and a neutral woman (pictured with dark clothes and glasses and described as liking reading). The finding that has been the focus of this paper's blog coverage is that for the girls that did not label math or science as their favorite subject, the feminine cues significantly reduced their self-reported interest in math as a career. They attribute this to the girls thinking that the feminine women are 'too good' and thus being discouraged because they don't see themselves as ever reaching those heights. While this is an interesting hypothesis, a closer look at the study is merited. First of all, there is not un-gendered control study. Might a similar effect might show up for middle school boys when shown either a muscular, athletic man who likes football or a neutral man who isn't particularly muscular, wears glasses and likes reading? This could be a general 'attractivity' thing where kids are intimidated by role models who 'have it all' or 'are too good'. Maybe it's not really a gender issue. Secondly, what hasn't been discussed much is that 54% of the girls initially listed math or science as their favorite subject! And for those girls, the femininity of the woman in the article had no statistically significant effects on their interest in science and math. 54% ! more than half of the girls in this study reported science, math, or both as their FAVORITE subject! and while there were no significant effects, there was a trend (p=0.19) toward the femininity of the role model increasing these girls' report of how 'attainable' both her femininity and scientific success might be. 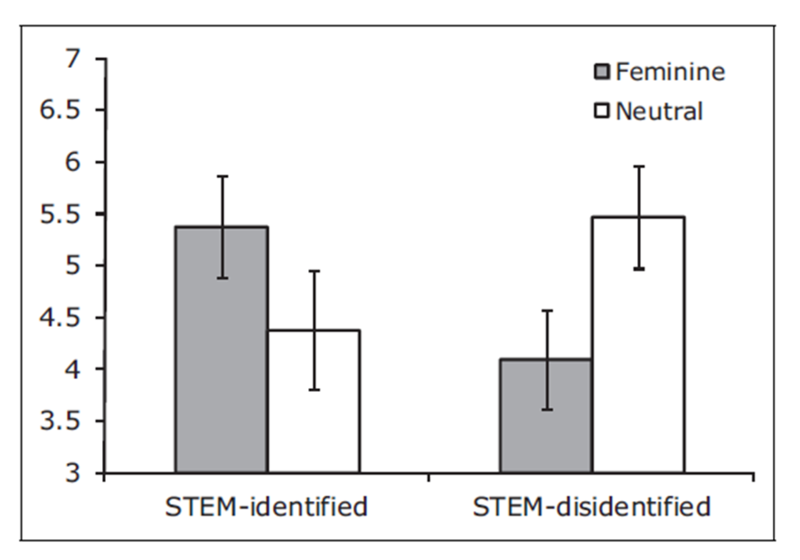 This graph shows the "self-reported likelihood of attaining role model femininity and STEM (science, tech, engineering, and math) success" If anything the feminine role model slightly increased the attainability of these characteristics for girls who already like science (not significant, p=0.19). Regardless, I think the conclusion that feminine-looking science is bad for girls is not on sound footing. And again, I defend pink microscopes. If you have already seen the It's a girl thing video, you might be now expecting me to support it. But don't worry, I think it is as idiotic and every other scientist on the planet does. Far from showing feminine scientists, it is showing a scientist (the man) and separate from that a bunch of giggly girls dropping things. NOT HELPFUL. The only part I liked was the girl looking like she was concentrating and writing equations on the clear board. She looked feminine and pretty and she was 'doing' science. If these girls had been actually doing science through the entire video (sitting at microscopes like the guy did, for example), I might actually have liked it. The thing that is wrong with this video is not that these girls are wearing heels (though short skirts do violate lab safety codes), or that they look feminine or pretty. That's all fine. The problem is that they are not doing science, they are giggling and blowing kisses. If your goal is to combine femininity and prettiness with science, you have to COMBINE them, not present them as two completely separate things. I want to see what they’d come up with to get more LGBT people and ethnic minorities into science. “Science: it’s a gay thing!” featuring Abercrombie and Fitch models, bare-chested apart from an open lab coat, playing with unfeasibly suggestive phallic test tubes. Cut to discotheque-esque laser equipment and the word “science” with the C as a big rainbow. Or how about “Science: it’s a black thing!” – grinding hip-hop beats accompanying blinged-up rapper types in pimped-out lab goggles, gold-rimmed petri dishes, Neil DeGrasse Tyson with a ridiculous posse behind him, research grants delivered in unmarked bills… yeah, you get the idea. Well it amused me anyway." I concur! More power to Pink lab equipment! The fact that the girls in the study who did not choose math and science as one of their favorite subjects and who after experiencing the feminine cues actually reduced their interest is a sad statement about low self-esteem of the girls. The girls obviously feel that they can do nothing to reach the success of the woman scientist. It is a shame that this learned helplessness could have such an impact on the way that they think and feel about themselves. And even a greater shame that this learned helplessness could lead to even bigger problems in their lives; depression, drug addiction, abusive relationships, etc. These girls are young and they can overcome this helplessness but they need to work at it and they need support from others around them to regain control of their lives. They need to replace the learned helplessness with "learned self-respect" and "learned confidence". And by the way, I like the pink microscope! I love that pink microscope..also it's some kind of a girly stuff..
What do mirror neurons look like?